Nyxon | Pump That Pedal - We've got it, You want it, Come and get it. Favorite Type of Shoe: I like heels & boots. Worst Car Trouble Experience: I was at a wedding reception and as I was getting ready to drive home, my light switch in my car broke off and I had to drive home with no brake lights and only high beams. No feet shots in this clip. 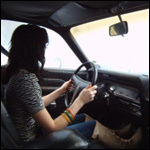 This is a one-angle video of Nyxon driving the Coronet around. The camera is mounted high on the front windshield and gets most of her legs but cuts off just below her knee. She has trouble starting it up in the first few minutes…. Played around with a ceiling shot in the Bug when this lovely lady stopped by well over a year ago. She tries starting the 72 Super Beetle but it’s being it’s typical annoying self. She talks a lot about her struggles and even teases you a bit, asking if this…. Ride along as Nyxon drives the old Dodge Coronet around. She works the pedals in a pair of flat, tan boots that come up just a bit over her knee. It’s a gloomy day and fortunately for her, the Coronet doesn’t give her any issues but the traffic irritates her…. 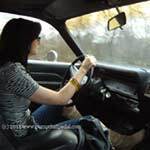 I set up some cameras in the Coronet and Nyxon is going to drive it to the gas station because it’s almost out of gas. It had rained here a few days prior and I parked the Coronet in that sweet stuck spot. I had already moved the other cars…. I got Nyxon on a little errand to the store and gave her a few incentives if she can make it quickly. It’s cold and the Bug is in no mood to go anywhere, thus her futile attempt to leave.